Flow cytometric analysis of 293T cells, mock transfected (blue) or transfected with a construct expressing myc-tagged Cas9 (S. aureus) (green), using Cas9 (S. aureus) Rabbit mAb (PE Conjugate) (solid line) compared to concentration-matched Rabbit (DA1E) mAb IgG XP® Isotype Control (PE Conjugate) #5742 (dashed line). Cas9 (S. aureus) (E4G3U) Rabbit mAb (PE Conjugate) recognizes transfected Cas9 (S. Aureus) protein. This antibody does not cross-react with Cas9 (S. pyogenes), AsCpf1 (Strain BV3L6), and FnCpf (Strain U112). Monoclonal antibody is produced by immunizing animals with a synthetic peptide corresponding to residues surrounding Val905 of S. aureus Cas9 protein. This Cell Signaling Technology antibody is conjugated to phycoerythrin (PE) and tested in-house for direct flow cytometric analysis in human cells. This antibody is expected to exhibit the same species cross-reactivity as the unconjugated Cas9 (S. aureus) (E4G3U) Rabbit mAb #51610. 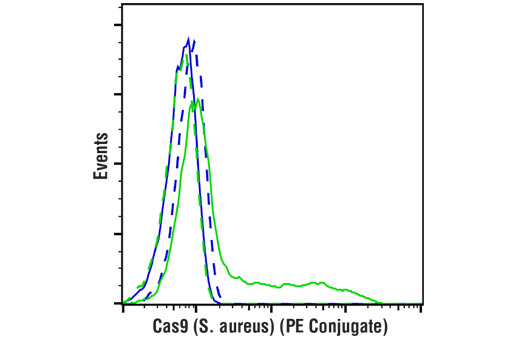 Cas9 (S. aureus) is a Cas9 ortholog that is smaller, but as efficient, as the more commonly used Cas9 ortholog, Cas9 (S. Pyogenes) (9). Ran, F.A. et al. (2015) Nature 520, 186-91.